If you have lost your passport or had it stolen and are age 16 or older, then a lost passport is the correct application for you. Once you place your order below, you will be assigned a personal agent to your account and sent a pre-addressed FedEx label to send your photos as well as other required documents. This service is to expedite your passport that does not constitute standard processing. Once you place your order below, you will be assigned a personal agent to your account and sent a pre-addressed FedEx label to send your photos as well as other required documents. Please select an option below that best suits your needs. 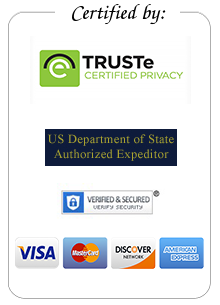 Fast Passport Center is a certified expeditor and submits passport applications directly to the U.S. Passport Agency. Processing times begin once your documents are received, reviewed and they are submitted with the passport agency. We are able to help anyone in all 50 states including the United States outlying territories. Please select an option below that best suits your needs. Fast Passport Center will replace your passport if it has been lost, stolen, or damaged in transit by FedEx or UPS shipping to and from your location. Fast Passport Center will replace your passport if it has been lost, stolen, or damaged within the 5 years of issue date. Insurance coverage does not include replacement of expired passports, name changes, or valid travel visas. The time frame in which you will receive your replacement passport will be the similar to the service you have purchased. To make a claim, please call 877-292-5505, one of our passport specialist will assist you in obtaining your new passport. Note: If you are traveling abroad, We provide you with specific instructions as well as important numbers so you can speak directly with someone who can help you. U.S. Embassies and Consulates are a phone call away, and with the Plan you are assured free transmission of all the forms and applications you need. This necessity for any international traveler lasts for the lifetime of your passport so it is always there when you need it most.. The new wallet-size U.S. Passport Card is a travel document that can be used to enter the United States from Canada, Mexico, the Caribbean, and Bermuda at land border crossings or sea ports-of-entry. Note that it cannot be used for international air travel. The passport card is more convenient and less expensive than a passport book. Under the REAL ID Act, the passport card is also accepted for federal purposes (such as domestic air travel or entering federal buildings), which may make it an attractive option for people living in states whose driver's licenses and ID cards are not REAL ID–compliant or cannot be used for domestic air travel. Seven more states in 2018 do not allow domestic air travel with a driver's license or state ID card because they are not REAL ID-compliant. Get your REAL ID-complaint passport card with your order so you can fly domestic in the future with only your passport card. What happens after I place an order on the website? Corey, we made our trip! I still cannot believe you were able to get my wife’s passport renewed in just one day. Thank you again for walking me though the whole process and going the extra mile to make it happen in such little time. I was concerned that we were going to have to cancel our trip to Central America since we found out our twins’ passports were expired days before our trip. Your customer service agent named John made the process very simple and easy. Pura Vida from Costa Rica! We found out that our daughter’s passport had expired just the day before we were due to leave. Called around to several passport agencies, and spoke to Nathan. He was the most knowledgeable, and had the best service. We went with Fast Passport Center, and don’t regret it! Great results, they got the passport right on time, just as promised. Strongly recommend.. I just wanted to send you a Huge HUG and THANK YOU! With your assistance and the professional service that your company provided, I was able to receive an expedited passport to enjoy a fabulous All Ladies trip for 5 days in Jamaica! There were 14 of us! No kids, no boyfriends, no husbands! Although it came down to the wire before my trip departure, I made it!!!! I was a bit dubious dealing with a company I haven’t used or had a personal recommendation for but you delivered as promised. Feel free to use this as an endorsement if it helps. Your company was great & delivered exactly as promised! As a travel agent, I will recommend to my clients for future services.